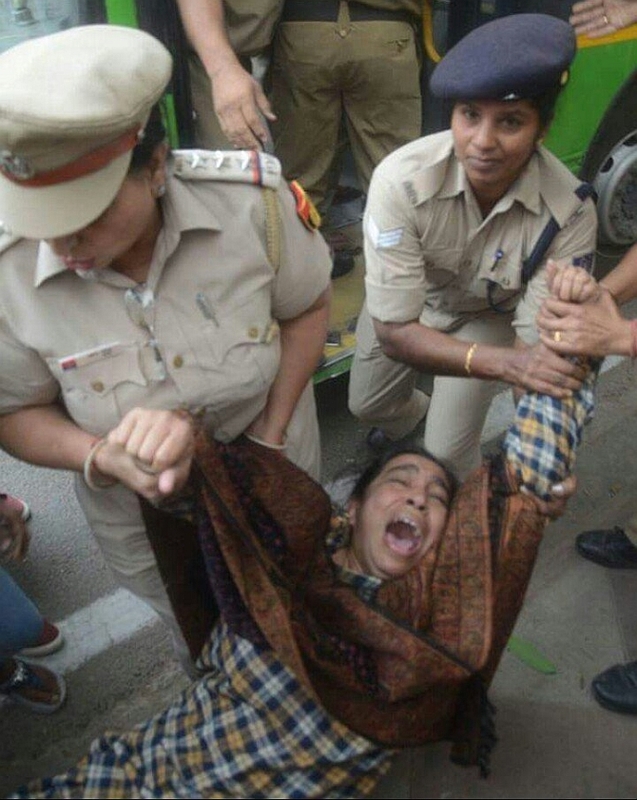 The way Fatima, the mother of Najeeb Ahmed (#najeebahmed) the missing JNU student was treated on November 6, 2016 evening by the Delhi Police was just appalling. She was at a rally peacefully protesting with several others about the mysterious disappearance of her son. They were demanding that the Police and the Central Government need to do much more to trace Najeeb. The rally was disbanded by the police. There is enough of evidence (viral on social media) to show how Fatima was dragged, manhandled and detained by the police. Several other protestors (including students) were also detained. This is not the first incident happening this past week. Some opposition political leaders who were protesting the death of a retired soldier were also arrested and were made to stop their protests. The son of the soldier who had gone to meet these leaders was beaten up by the police. The popular TV Channel NDTV, will be taken off the air on November 9th for 24 hours because of the inconvenient questions they asked and their coverage of the Pathankot terror attack that took place on January 2nd this year. Another channel from Assam has been given the same treatment. For several months now, there has been a virtual black-out on the media (mainly electronic and social) from Kashmir. The BJP, the main ruling party, has gone to town about the “surgical strikes” on Pakistan. This is rather unfortunate. Anyone questioning the veracity of these ‘surgical strikes’ or asking for more information is termed ‘anti-national’ or ‘unpatriotic’. Pakistan certainly does not have a favourable track record either on human rights or on the freedom of its citizens. However, there are well-meaning citizens in both countries who would like the avenues of dialogue to be kept open and to continue Indo-Pak bonding on meaningful fronts. This is also frowned upon. India has upped its military spending. Precious foreign reserves are squandered on what is conveniently referred to as ‘upgrading’ the military. Countries who need to sell from their stockpiles, find India an easy customer. The budgets for essentials like education, health, agriculture, employment generation, poverty alleviation programmes- have been drastically cut. This does not augur well for ‘development’ meant to be inclusive and holistic. Human rights defenders are pushed to the wall. Organizations which take a stand for truth and justice and for the Constitutional rights of the oppressed are denied the possibility of receiving foreign aid. Right-wing fascists with full support from the ruling class, lynch you or beat you because of what you believe in, eat, dress, write, see etc. Crony capitalism is on the rise. It has never been so bad in India! Opposition, students and liberal media are suppressed; Rights and Freedoms are curtailed; dissent is quashed! Today it is not merely the writing on the wall: the dismantling of democracy has begun!